The next step is actually making the app do something; this is when things got hairy. Cordova relies heavily on plugins to extend functionality. There is a nicely stocked repository online , and searching for "sensors" coughed up some interesting results. But I found that some of the sensor plugins were surprisingly old and unmaintained. Others had emptied out repositories, or the plugin list links that led to 404 errors. And then there were those loudly labeled as obsolete. It was very confusing. It made no sense that really no one was interested in maintaining plugins that accessed a mobile phone's sensors. Unless there was no point, of course. Figure 7: A web page with an integrated working compass. Warning: This will not work on devices without magnetometers. 2. 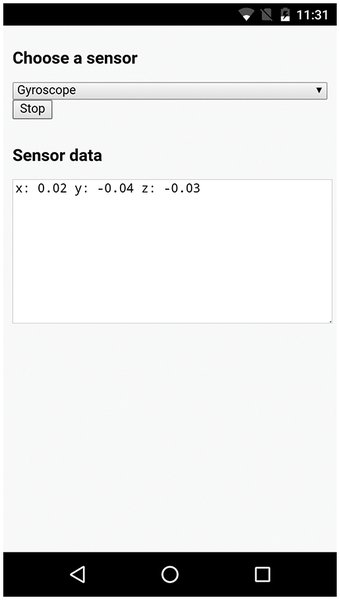 You can integrate sensor data into your Cordova apps. 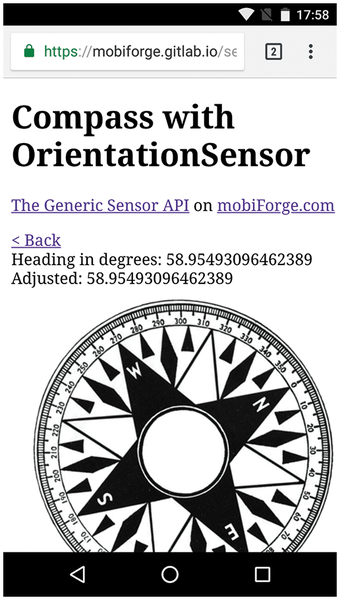 The W3C spec lists 10 sensors you can pick from: Accelerometer, AmbientLightSensor, Magnetometer, Gyroscope, OrientationSensor, LinearAccelerationSensor, AbsoluteOrientationSensor, RelativeOrientationSensor, GeolocationSensor, and ProximitySensor. Note that not all sensors will work on all devices, and there are some that won't work on any device, since there are no web engines that have implemented them yet. Or you can do like in Listing 3, line 12, and embed the function directly into the addEventListener() method. When a user clicks the button, you take the value from the selector (Accelerometer, Gyroscope, or LinearAccelerationSensor) and use it to initialize the sensor (line 9). As you are only going to print the data out, the callback function (lines 12 to 14) is short. The callback function takes a parameter (event) that holds the data from the sensor. The event's target retrieves the element that triggered the event, in this case, the sensor itself. The x, y, and z attributes are common to the three sensors in the list – which is why they are in the list, as other sensors have different properties. The point is you print out the sensor's x, y, and z values on line 13. To build the app and launch it on your phone, first make sure your phone is in developer mode by going to Settings | About phone and scrolling down until you see the Build number section. Tap on that several times until your phone says you are a developer. Connect your phone to your computer using a USB cable and move back to Settings. You will see there is a new submenu called Developer options. Tap on that and scroll down until you see the USB debugging option. Activate it. Cordova is using the Android Debug Bridge (adb) to try and locate your phone. The devices option shows a list of connected devices. again, and a dialog will pop up on your phone asking you to authorize your computer. Give your computer permission, and try listing your devices again. Your phone should now appear as available. Cordova will automatically install and run the app. The final result will look like Figure 8. Figure 8: Your first sensor-aware Cordova app. In my next installment, you will learn how to extend your Cordova app, so it can transfer data to you computer. You will also learn how to integrate the data into a desktop application, so you can use your phone as a controller.